Is that a salad-in-a-jar? My mother used to make me those! 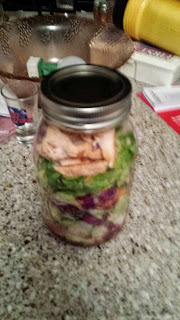 Yes ma'am it is salad in a jar. I think that's the one I added the southwest chicken strips to but these are all the healthy don't be lazy meal craze right now.